Recently I discovered a wonderful flickr group called ‘Organised Collections‘. Inspired to put my own collection together I combined my linens (which are now filled with pattern piece markings) and my pebble and twig collection. Each pebble and twig is special to me. To remember them, I have written where and when I picked it up on each one. The first twig I collected was on my first day of high school. Somehow I did not have a hair elastic and whilst sitting in register I reached for a stick, rolled my hair into a bun and carefully slid it through holding my hair in place for the rest of the day. I still have this stick and I love running my fingers over its now smooth surface. 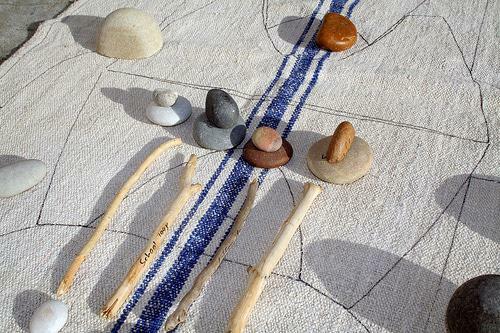 This entry was posted in Blog and tagged compositions, Organised collections, pebbles, twigs. Beautiful photos. I’ve never managed to learn the hair and stick trick – I’d love to be able to do that to my hair. Beautiful photoÂ´s!Have a nice week! Those pebbles are so round!!! beautiful! I had never met a before a person that collected twigs… look at that.